The Government of Bhutan through the G2C (Government to Citizen) Office under the Prime Minister’s Office organized a mobile app development competition with the aim of enhancing public service delivery. Participants were invited to design and submit mobile apps in three categories: 1) Health and Education; 2) Youth and Women; and 3) Public Safety. 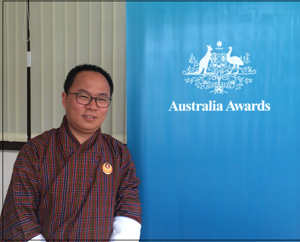 Sonam Tobgay, an Australia Awards alumnus working with the Ministry of Information and Communication (MoIC) took part in the competition under the Youth and Women category and won first place for his app called the “mPowerYOUth”. This mobile app enables youth to access counselling services with complete anonymity. Through the app, youth can also receive information on youth events, information on the locations of counselling centres, helpline numbers, contact details of counsellors in various locations in the country, and news feeds. The app was officially launched by Lyonpo Dawa Gyeltshen, Minister for Home and Cultural Affairs on 11 August 2015. The app is available for download at the Google Play Store. After successfully completing his Master of Computer Science from the University of Western Australia (UWA) in 2013, Sonam returned to the Ministry of Information and Communication where he worked. Besides his normal IT sector functions, Sonam was always looking for opportunities to showcase the knowledge and skills he acquired from his Australian education experience. G2C’s call for mobile apps competition gave Sonam the right platform to put his learning to use. Having developed a health-based app for a group project at UWA as part of a unit on wireless computing, he was inspired to take part in the competition and replicate some of the learnings from the project. Sonam also said that he has been very concerned by the various emerging youth-related issues in the country and wanted to do something to help. He pointed out that while there are counselling services available in schools, as well as other youth-focused service windows like the Department of Youth and Sports, he feels that youth are still very reluctant to avail face-to-face counselling services. While it is still too early to measure its impact, he hopes the app is able to reach out and help youth to access counselling services without fear of being stigmatised. As the Department of Youth and Sports has access to the backend data, Sonam hopes that officials at the Department and school counsellors are able to access the data to enable them to plan interventions based on real data. He hopes that the app will not only empower youth but also contribute to government’s on-going initiatives in tackling youth-related issues, and fulfil the service delivery objectives of the Prime Minister’s Office and the Government.